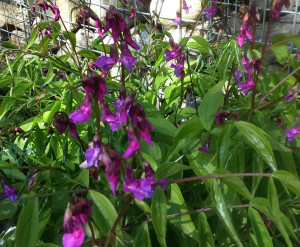 This delightful spring flowering pea can be found in the Growing Schools Garden, if you look carefully. The Spring vetchling as the plant is commonly known is a dense clump forming perennial can be found in woodlands across Europe, and is related to the sweet pea. It enjoys growing in moist partially shaded sites and if it dries out can retreat below ground for the summer. In spring it has a single sided spike of flowers (a raceme) with up to ten flowers along the side in a lovely purple colour. The pea green leaves are divided into two or four pairs with sharp pointed leaflets but not tendrils for climbing sometimes appear after the flowers.